This homemade homemade multivitamin tea tastes delicious! It is packed with lots of nutrients, does not have any bitterness, and it’s all natural. I run out of this tea fast and I do make it regularly, because we all love it so much. This tea includes dried herbs like alfalfa, stinging nettle, rosehips, dandelion roots, red raspberry leaves and oatstraw. Awesome combination! I got this multivitamin tea blend recipe from Meagan Visser’s blog and I LOVE it. 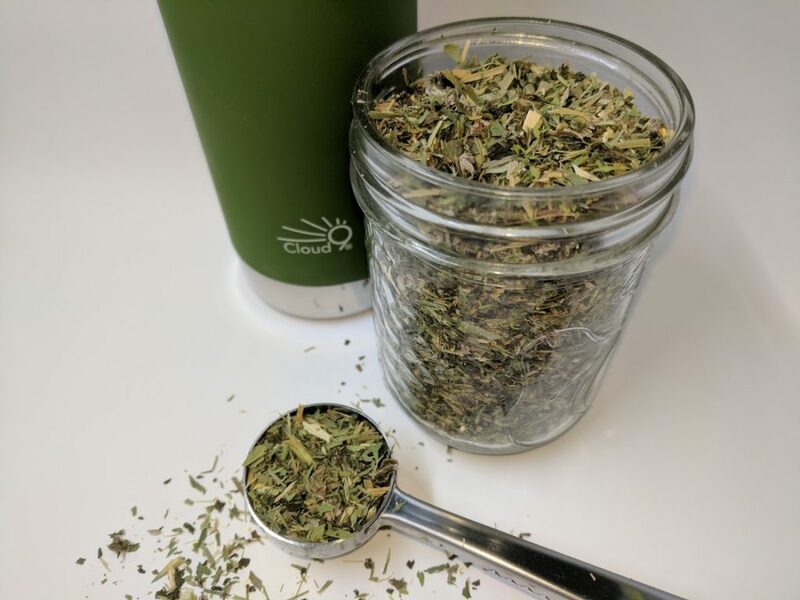 It tastes so good that it quickly became my favorite blend of tea! I slightly modified the original recipe making it fit my own needs. Children love the taste of this tea, and adults love them even more. This is one of those recipes that I try to keep, save, and record, because it is so valuable. There are tons of recipes around, however it is so hard to find the ones that actually work for you. This one definitely does! I would like to thank Meagan for this awesome recipe! Alfalfa is packed with vitamins and minerals. It contains eight essential amino acids, iron, calcium, phosphorus, sulfur, magnesium, chlorophyll, potassium, and other trace elements. Alfalfa is popular for nourishing the digestive, skeletal, urinary, and glandular systems. It cleanses the blood, may prevent blood clotting (as it is rich in vitamin K), and builds stamina. Alfalfa must be avoided during pregnancy. I buy dried organic Alfalfa in bulk from Starwest Botanicals. Red raspberry leaves are rich in vitamin B, calcium, and iron. Red raspberry leaves are traditionally used to treat diarrhea, mouth inflammations, burns, varicose vein ulcers, influenza, morning sickness, and heavy periods. It was widely used to prevent miscarriages, to ease labor and delivery. I purchase dried organic Red Raspberry leaves in bulk from Frontier. Nettle is rich in iron, calcium, zinc, and chromium. Stinging nettle is traditionally used for allergy relief, for reducing bleeding when applied to the skin, to treat eczema, for preventing hay fever symptoms, and to reduce joint pain. There is not much information available to know if stinging nettle is safe or not during pregnancy. Some sources claim that dried nettle infusions are safe to consume during pregnancy if consumed in moderation. Stinging nettle is used in many Pregnancy teas also. I purchase dried stinging nettle leaves in bulk from Frontier. Rosehips are packed with vitamin C! They can also help improve skin health, enhance blood circulation, and improve kidney health. I purchase seedless organic cut rosehips for this tea, but you can also use the whole dried fruits. Whole rosehips take longer to brew.. The cut seedless rosehips worked better for this tea for me. The seeds can be itchy when touched with bare hands. Oatstraw is rich in B vitamins, silica, calcium, and chromium. 1 cup of oatstraw infusion contains about 300 milligrams of calcium. Oatstraw is great for bone, skin, and hair health. This herb can help sooth the over-stressed nervous system and provide anxiety relief. I use dried, cut and sifted organic oatstraw for the tea. Dandelion root is rich in sodium and iron. Dandelion root might have anti-cancer properties, some research suggests. It also improves the liver, normalizes high blood pressure, boosts immune system and increases urine production (diuretic). I usually purchase dried, cut and sift dandelion roots. Dandelions grow everywhere, so you can harvest the roots from your backyard as well. Mix the herbs and keep in an airtight glass container or a tightly covered jar. Avoid liquid or water dripping in it accidentally when you store the tea – it helps to avoid the mold issue (this applies to everything stored in an airtight containers like dry spices and herbs). label the jar. I pour 1 cup of boiling water over 1.5-2 teaspoons of this blend to make a tea. You can adjust the amount depending on your taste and preferences. We don’t like strong teas, so I make it this way. Let sit covered for about 5 minutes (or leave overnight). Strain and enjoy! If you want to use this tea blend as a general multivitamin for your children, then use 1:3 ratio (1 part herb blend and 3 parts water). Strain and let your child drink 2 cups a day. Hi, Angela! Sure. Why not. Thank you for your interest!